Embassy of Sri Lanka, Seoul, South Korea. 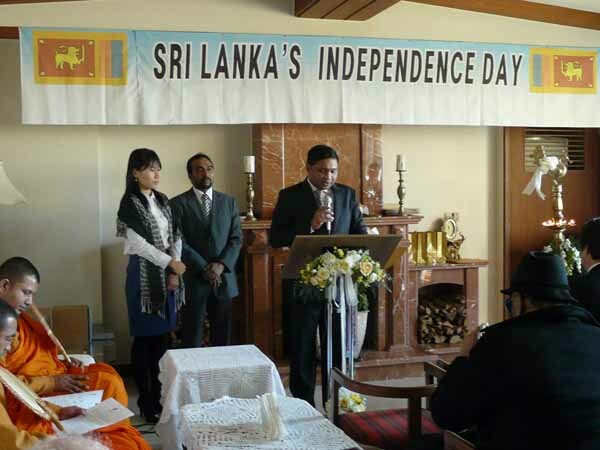 The celebration of the Independence Day and National Day commenced at the Residence of Sri Lanka on 04th February with the flag hoisting ceremony attended by a cross section of Korean and Sri Lankan distinguished personalities, representatives of Sri Lankan migrant workers and Sri Lankan students. A multi religious rituals with the participation of the clergy of Buddhist, Hindu, Christian and Islamic were observed and the National Day Messages of H.E. the President, Hon. Prime Minister and the Hon. Foreign Minister were read. Charge d’ Affaires Lakshitha Ratnayake speaking on the occasion mentioned that this year’s independence celebration is very important and meaningful for all Sri Lankans, because we are free from clutches of terrorism and people enjoy full freedom and sovereignty in each corner of the country. Therefore, all communities in Sri Lanka now can live under one flag and maintain unity and harmony among each other. He also stated the importance of improving bilateral relations with South Korea, in order to fulfill the vision of H.E. the President Rajapaksa to make Sri Lanka a “wonder of Asia”. Therefore, Sri Lanka Embassy in South Korea has determined to improve more relations in the fields of employment, investment, tourism, education, culture and aviation etc. The staff of the embassy had arranged a scrumptious lunch “”…” Sri Lankan cuisine for the participants at the event.